By now, your calendars should be marked and your excitement should be rising for the 2014 Armchair BEA. This year, we are excited to bring you the fifth annual event that parallels with Book Expo America in New York City. We are approximately one month away from the big kick-off, and we want to ensure that you have enough time to prep for our daily discussion posts and allow yourself to participate more fully during the week by meeting new bloggers, chatting about books and blogging, joining in our Twitter parties, and shooting a few pictures for our Instagram challenge. For that reason, we share with you our official 2014 Armchair BEA agenda today. Please note that we have continued with the dual daily topics, one that is blogging related and one that is related to the books that we love. However, this year, you will find that we have left you with more flexibility and less confusion when it comes time to share by using only one linky per day. We will bring you more information on these logistics when we kick off the event, but for now you can start brainstorming how you intend to contribute to the conversation. Without further ado, we enthusiastically present to you our 2014 Armchair BEA Agenda . . .
As in past years, we will provide you with a list of ten questions and ask that you answer FIVE. We are currently in the midst of revamping the questions, so all our returning participants will be happy to see a whole list of new choices. The list of questions will be published in approximately two weeks, so stay tuned. In each of the categories, we have given you some examples to get your creative juices flowing. However, we encourage you to take the topic and make it your own. You can choose to go with one of our recommendations or you can choose to go your own direction with the topic. We are very excited about our 2014 agenda, but now it is your turn to weigh in! What do you think? Which one of the topics are you most excited to dive into? After sharing your thoughts, be sure to share the agenda with all your blogging friends! Not yet registered for the event? You can register here! The Fifth Annual Armchair BEA is now open for participant registration!! Last year, we had almost 600 registered participants partaking in our daily discussion topics, twitter chats, new instagram challenge, and giveaways. This year, we hope to be even bigger and better. We have greatly increased our team this year to accommodate our larger numbers and to bring in new, innovative ideas. In the weeks to come, we will be announcing our official agenda, scheduling twitter chats, and soliciting your help to cheer on our participants. In the meantime, mark your calendars for Monday, May 26-31, 2014, grab our new button to add to your site (please be sure to credit our artist Amber! ), and complete the registration form below. We have heard your feedback this year, and will be sending an email in the weeks before Armchair BEA kicks off with reminders and special links. PLEASE NOTE: If you wish to have your item(s) hosted here, credit and link love will be given to you and we will handle the contest itself; however, you will still be responsible for shipping your item(s) to the winner(s). Shipping information will be provided to you by one of the members of the Armchair BEA Sponsorship Team once they have been selected. Sponsorship offers will be accepted until Sunday May 18, 2014 to allow for time to prep proper publicity for each. Thank you! Sponsors, if you still have questions feel free to contact Tif, Tanya, or Stephanie at armchairbea (at) gmail (dot) com. If you unable to view the form below, you can also access it here. Introducing the 2014 Armchair BEA Team & NEW Design! 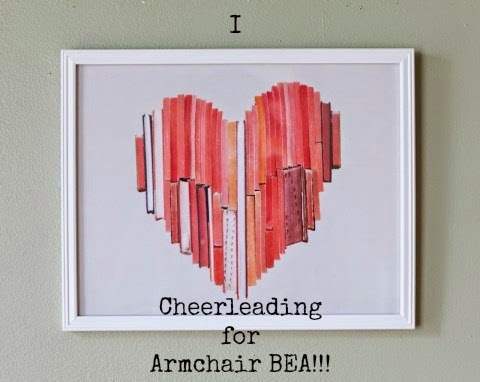 Last month, we put out a call for help in changing up and expanding our Armchair BEA team. We received a wonderful response and we are now very excited to announce and introduce the *NEW* 2014 Armchair BEA team! Before I make the new team announcement, however, I want to make sure you are all reading directly from the website. I ask this because we also have a *NEW* design courtesy of Amber from Shelf Notes. Go on, click on over, and check out this new beauty!! Everyone is already hard at work. Over the next few weeks, you can expect posts to increase here with more information on our 2014 event, including sponsorship information, registration, a call for commenting volunteers/cheerleaders, and much, much more. You do not want to miss out! Armchair BEA can be found on Facebook, Twitter, and Instagram. We can also always be reached via email at armchairbea AT gmail DOT com. We close with our NEW team. Please give them all a warm welcome! **We are still looking to expand our International Committee. Be watching for your opportunity to join our team in the near future!